Does it seem like cleaning up your house is a never-ending battle? If you invest in a great vacuum cleaner suited to your specific cleaning requirements, that’s half the battle won. Today, we will take the legwork out of it for you with the 5 best bagged vacuum reviews. We will look first at what to think about when you are choosing between a bagged or a bagless vacuum and why bagged vacuums are ideal for certain cleaning needs. When it comes to deciding between a bagged vacuum or a bagless model, there is no right or wrong choice. The best vacuum is the one that is the most suitable fit with the type of cleaning you have in mind. With bagged vacuums, you’ll get a bag fitted inside. This will collect any dirt, dust and debris until it’s full. Empty it and fit in a new one. The bags come in many shapes and sizes. They vary from model to model and across manufacturers. At the cheapest end, these bags are little more than a bulky paper bag that lets air pass through. With these bags, dust can be a nuisance. The more expensive bags have layers of fiber and foil and act as a simple, first-stage filter. You need to pay attention to how full the bag is. As the bag begins to fill, so you will start losing suction. Most models have technology in place to minimize the interference with airflow. You will also be able to see on the indicator when the bag starts filling. As a rule, shoot for emptying the bag when it’s around half-full. Bear in mind the added expense this will involve, though. When you are researching bagged vacuums, you should take the cost of replacement bags into consideration when budgeting. With a self-sealing opening for the hose, you can empty bagged vacuums quickly, easily and free of mess. For anyone with asthma or an allergy of any kind, this is one of the key selling points of a bagged vacuum. If you are concerned with the environment, these vacuum bags are not biodegradable so think about that before you buy. With the cheaper price tag offset by the need to buy bags for the lifetime of the appliance, bagged and bagless vacuums come out about equal. If you are sensitive to dust and want a reliable, solid vacuum, think seriously about a bagged model. As technology continues to leap forward, so the quality of bagless vacuums keeps on getting better. With improved suction, enhanced filters and a much more efficient method of emptying, bagless vacs have come a long way. The dust and debris are trapped in the dust container. Cyclonic technology separates the larger pieces and keeps them confined in the bin. Smaller particles are caught in the filter. With no need to keep shelling out for expensive replacement bags, getting a bagless vac might be pricier at the point of purchase but it doesn’t work out badly over time. If you make sure to keep the filters clean, you won’t notice a loss of suction. This is something that can adversely affect bagged vacuums. For anyone suffering from allergies, check for a bagless vac that can be emptied quickly, easily and with minimum exposure to dust. Generally, a bagless vacuum will have a smaller dust capacity. This translates to more frequent emptying. First up in our look at the best bagged vacuums is an extremely cheap canister from Bissell that doesn’t compromise on quality. If you have a variety of surfaces in your home then the Zing is tailor-made. You can flick a switch to swap between carpets and hard floors. From stairs through to rugs and upholstery, you can get anything sparkling clean with this bagged canister. At only 8 pounds, the Zing is a cinch to move around. There are also 4 wheels for added mobility. You won’t get much by the way of attachments at this price point. A floor tool and upholstery tool are a nice touch. 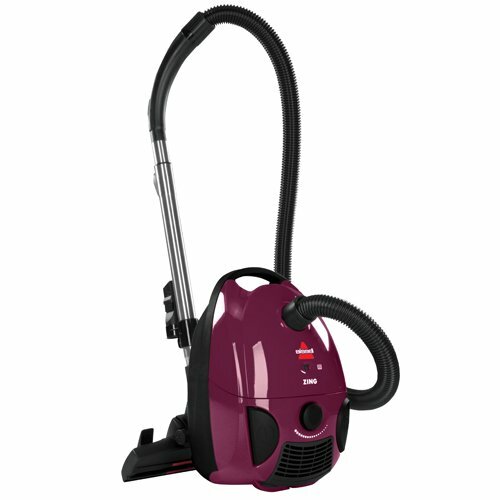 For a lightweight but durable bagged vacuum at an incredibly low price, take a good hard look at the Bissell Zing. This canister delivers in fine style. Hoover are such a household name that the brand name itself is often used to mean vacuum cleaner. The Tempo Widepath is a reasonably-priced bagged upright worth a place on any list of the best bagged vacuums. The powerful 12-amp motor equips you with the power you need to blitz any stubborn stains. With bags made from allergen media, if you have asthma or any other sensitive condition, this is the ideal vacuum for you. The cleaner is 15 inches wide giving you a great cleaning capacity. Although you get heavyweight performance from the Hoover, at only 15 pounds it’s still light enough to hump around without straining yourself. While the 6-foot hose is slightly short, the generous 25-foot power cord gives you a little flexibility. For a bagged upright perfect for cleaning carpets, you can’t go far wrong with the Hoover Tempo Widepath. Dirt Devil are an industry heavyweight and no list of bagged vacuum reviews would be complete without a trademark red Dirt Devil. Most uprights are powerful but heavy. The Dirt Devil generates ample suction from the 10-amp motor but tips the scales at just 10 pounds. Get the best of both worlds with power and portability combined. You need never again worry about emptying the bag. A nifty indicator will alert you when it’s starting to get full so you can take action. The 5-point adjustment system means you can clean any surfaces fuss-free with the Featherlight. MicroFresh filters are great from anyone menaced by allergies. A wide, 13-foot cleaning path means you can make less passes while getting first-rate cleaning results. For a budget vacuum with the functionality of a much more expensive unit, the Dirt Devil is worth further investigation if you’re looking for the best bagged vacuum. Our penultimate bagged vacuum is a rugged commercial upright from Oreck, another industry-leader in the cleaning world. Weighing only 8 pounds but packing a considerable punch, the suction on this Oreck is extremely impressive. The 12-inch cleaning path is wide enough to slash the time you spend vacuuming without sacrificing results. Although it’s a corded upright so you’ll be restricted to working near a power supply, the long cord means you’ll still have room to maneuver. The Oreck comes into its own with low-pile carpets and gets them impeccably clean with very little effort. You’ll be limited when it comes to cleaning above the floor and there are no headlights to guide your way. 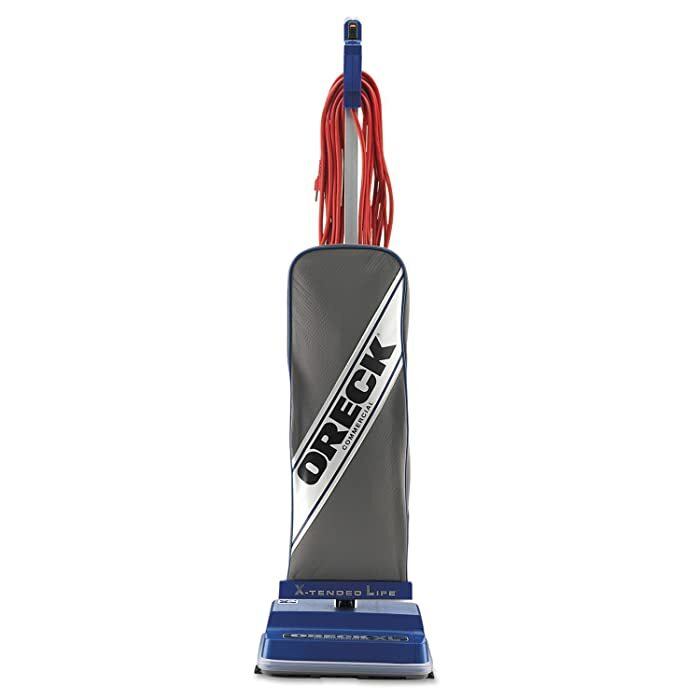 Overall, if you want a solid and dependable bagged vacuum that will last the distance, pop this Oreck on your shortlist. 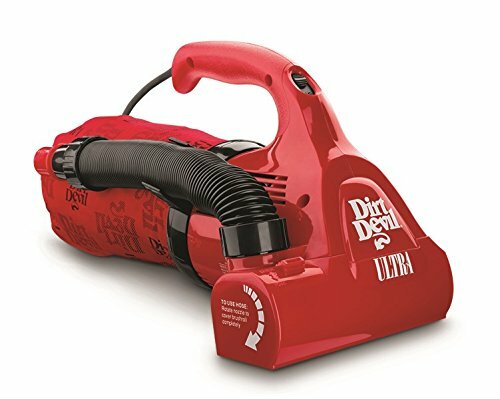 To round our reviews of the best bagged vacuums, this awesome handheld is another offer from the legendary Dirt Devil. If you want the extreme portability of a handheld, this Dirt Devil is well worth adding to your cleaning arsenal. It’s no replacement for an upright but it makes a great extra vac. For pet owners, the motorized brushroll makes sucking up spillages and hair a breeze. The Dirt Devil really excels with hard floors. With a HEPA filtration system, this vacuum hits the spot for anyone with allergies. This very cheap handheld vac does come with a few downsides. The power is sorely limited and you won’t get the incredible suction offered by most uprights. The flipside of this is an extremely capable handheld bagged vacuum that makes light work of pet hair and dander and renders your laminate flooring as good as new. Bestsharkvacuums.com is a participant in the Amazon Services LLC Associates Program, an affiliate advertising program designed to provide a means for sites to earn advertising fees by advertising and linking to Amazon.com. Additionally, Bestsharkvacuums.com participates in various other affiliate programs, and we sometimes get a commission through purchases made through our links.